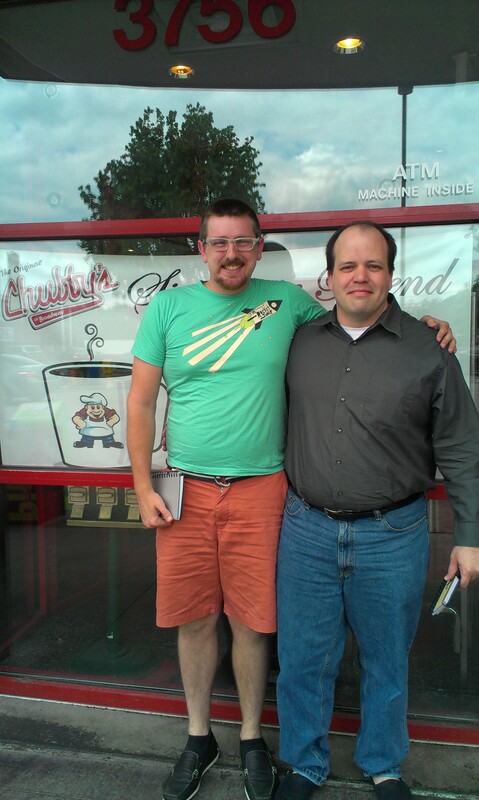 May 29, 2013 – 12:00 P.M.
Chubby’s on Broadway is a staple in the Kansas City greasy diner circuit. Chubby’s is open 24 hours a day except for Monday 2 PM to Tuesday 6 AM and offers everything you can imagine at a diner. More info, as well as their full menu, can be found on their website. Be sure to check out their Facebook and Twitter pages as well. Introduction: I hope you noticed a new face in the picture above. This face belongs to Brent Morgan. He has been a friend of mine (Jared) for about 5 years. He is the man who officiated my wedding. He has been insanely supportive of the Panclog right from its syrup-y birth. He is crazy smart and I am glad to call him the Panclog’s consultant. Brent is also the man who recommended Eggtc. to the pancloggers. Service: Service was exactly what you would expect from a diner. Our waitress was always ready with more water whenever we needed. Menu/Selection: This is a diner that doesn’t have any food that you should be afraid to eat. Chubby’s breakfast is pretty extensive. They have plenty of tasty omelette options. Chubby’s also has plenty of different types of meat you can add to your meal. Let’s talk about the names of pancakes. There is pancakes of course, hotcakes, flapjacks, and griddlecakes. I personally hate the name, hotcakes, its is so weak. McDonald’s uses that name so you know of the quality it holds. So, i believe that Chubby’s made a mistake going with the name hotcakes. I love the name flapjacks. When I think of the word “flapjack,” I see a strong, burly lumberjack who after a long day of chopping down trees with his wicked beard, comes home to a tall stack of thick, rich pancakes. He is instantly satisfied and is no longer sore from the hardest work you can imagine. I mean it is terribly hard to cut down a tree with a beard. Don’t believe me? TRY IT! So yeah, I prefer my pancakes be called flapjacks. 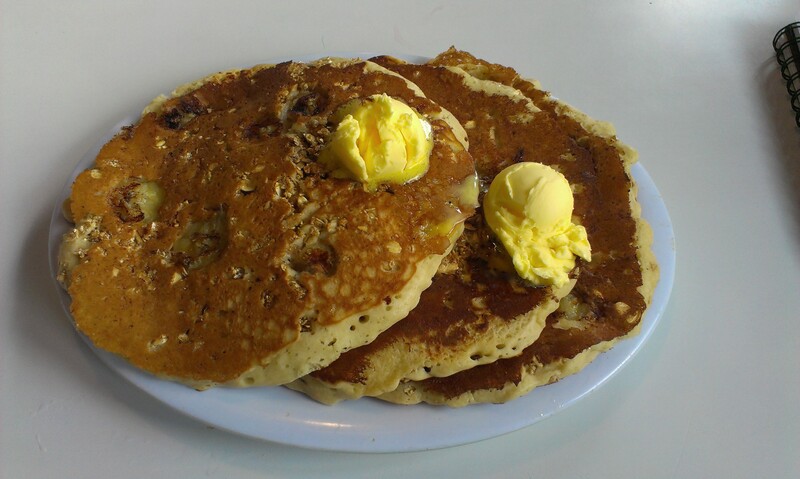 Chubby’s has 5 different pancake varieties. I chose Banana Crunch with Granola. The granola gives the crunch. I originally thought that the granola would be too crunchy and could make this meal a pain in the mouth. But I was definitely wrong. The granola added only a hint of crunch. I believe the granola was softened from being first soaked in batter and then in syrup. I was very pleased with these pancakes. The only thing that made me cringe were the very hot banana slices in the pancake. My mouth was not forever injured, do not fret. The banana cooled down soon after the first few bites. I am sad to admit that these pancakes were the first I did not finish in my Panclog adventures. This was not due to low quality, it was due to the fact that they were so filling. Also I could be getting skinnier and may not be able to handle that many pancakes. JK LIKE THAT COULD HAPPEN! I paired my breakfast with a large chocolate milk. It was priced at $2.49. I was a little disappointed to find out that this chocolate milk was just regular milk with chocolate syrup in it. This shouldn’t make you shy away from this tasty beverage, it should just be noted. My first time with the Panclog and I have already deviated from the norm. In lieu of pancakes, I went with Billy Butler. What can I say, I am a huge fan. Plus he is my daughter’s favorite player. There is no way I can go wrong with this. To get the Billy Butler, you will have to request the Country Breakfast from the menu. As an aside, I just learned that Billy Butler’s nickname was given to him through twitter and his adoring fans. Billy has used the sound of bacon sizzling as his walk up music. This will forever endear him to the fans of KC. Back to the food. 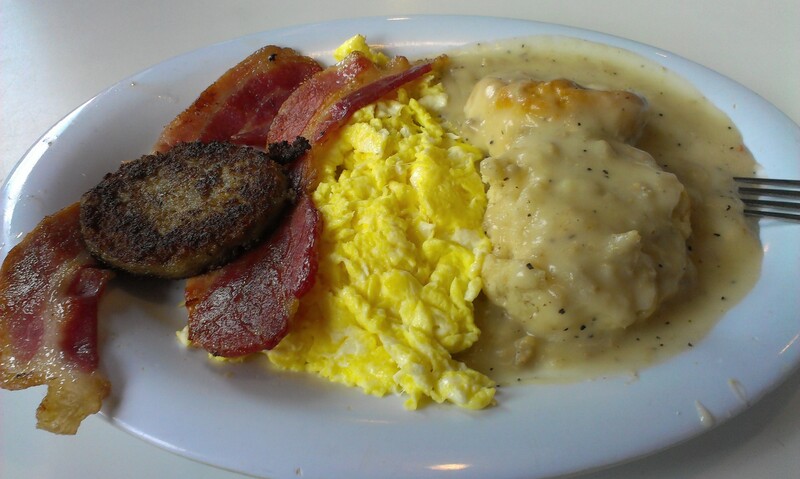 The Country Breakfast plate is simply a large biscuit, two sausage patties slathered in gravy. The meal also includes your choice of two eggs cooked however you like them and your choice of potato. I am a huge fan of biscuits and gravy, even though my grandfather-in-law used to make fun of me for eating wallpaper paste. While the gravy at Chubby’s was a tad salty, the whole plate was still worthy of note. Especially considering the shear amount of gravy that could be extended to the eggs and potatoes. This is a win in my book. My traveling companion asked how I felt about the sausage patty vs. sausage link debate. He appears to lean more towards the links. All I can say is that sausage is good in its many wondrous forms. Overall, I would say that the food at Chubby’s is satisfying, I left a content man. If there was anything to detract from it was Chubby’s special coffee blend that left something to be desired. Price: Chubby’s on Broadway is right on par to have prices similar to other popular diners. Overall: Chubby’s is a great diner that has a unique personality. It may have some flaws but we believe you will leave happier than you came in.